I really like Sharpies, and I have talked about them a few times before. There’s a reason they’re so popular, and as they continue to become more used they are diversifying their product range. 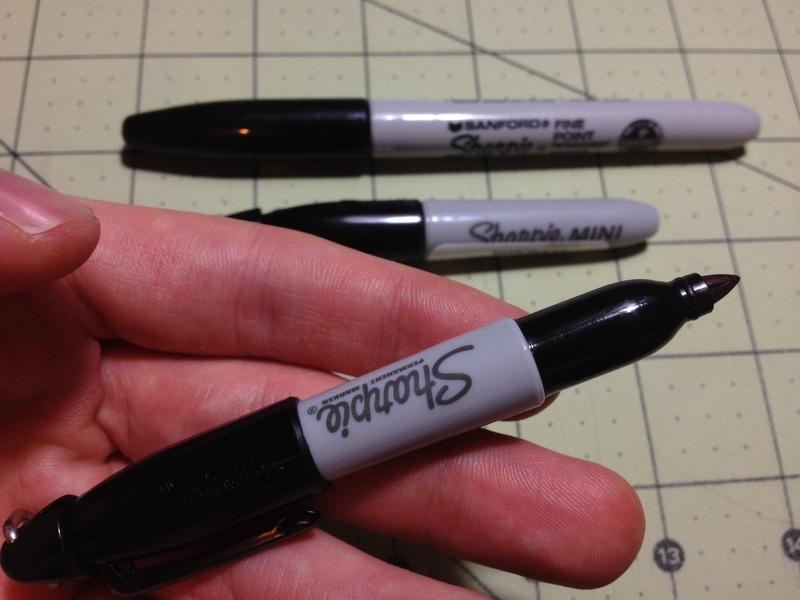 One such product that came out a while ago is the Sharpie Mini, which is, as the name would imply, much shorter than the average Sharpie. It has the same starting and ending diameters as the regular sized Sharpie, with an extra part on the tip that snaps on with a lanyard “ring” (triangle). Both the cap and body have been reduced in size, but proportionally the cap is larger. The clip is very similar, but shorter, and works well enough but not fantastically. The necessary information is still printed on the side. The size is quite small, at 3 and 11/16ths inches capped, down from a standard Sharpie’s 5 and ½ inches. Most people would find the uncapped marker uncomfortable to hold without posting, and it’s still only tolerable when it is. The odd shape of the cap and grip make it strange to hold. The rest of the writing is all the same as a regular Sharpie, with a cool black line, very permanent but not perfect (archival) qualities, a nice tip, fast drying, and the ability to smoothly put down a ton of ink. There’s not much more to say than that they’re smaller Sharpies. And if you like Sharpies but want a more portable option, here it is. The only downsides are they are somewhat awkward to hold, and have less ink. I personally didn’t like the lanyard ring, but that just pops right on and off, so it’s no problem. I have Sharpies around with me a lot because they’re so versatile, and this is a great little thing to decrease their needed carrying size with. 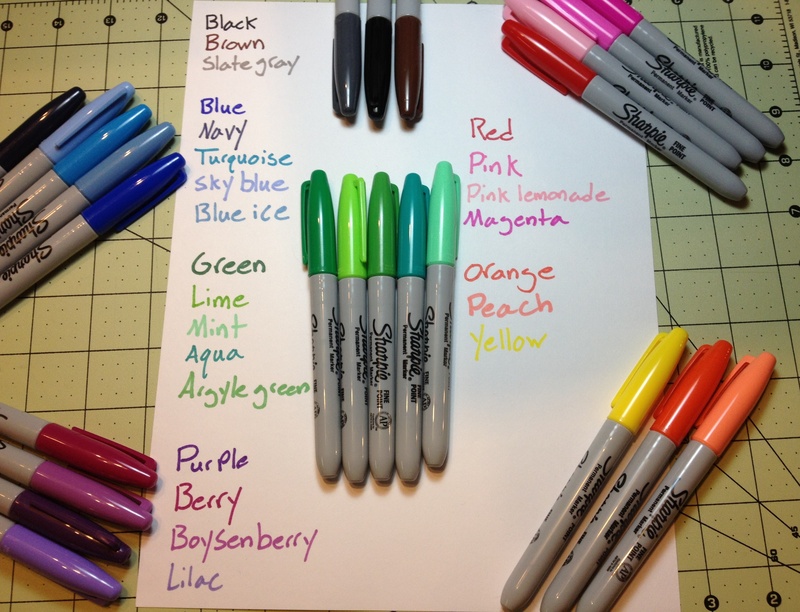 We’re five parts in to my look at the various Sharpie pen colors I have. This time I will be looking at some of the various shades of red. Red – The red itself is a deep, dark color. It’s close enough to the color of a red rose, and surprisingly (or unsurprisingly if the dye for both is those red bugs) ketchup. It’s not very aggressive or eye-hurting, but it stands out and is good for marking and work-appropriate. It’s not the best or worst on the bleed-through side of things, but has almost no shading or feathering. It’s a good color, if a bit boring. Pink – The pink is also a bit like a rose, not getting quite to the obnoxious hot pink style, but still bright and visible. It’s not the most natural color, but it does separate things out from the crowd. Bleeding is again medium, feathering and shading are a bit more pronounced than on the regular red, though. 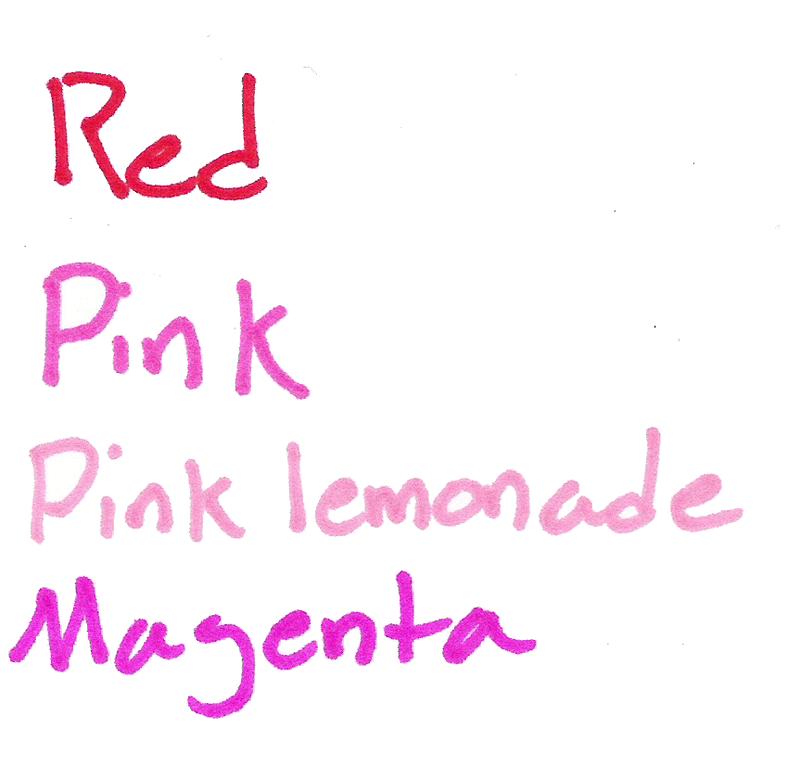 Pink Lemonade – Pink lemonade is indeed the color of pink lemonade, or of a pink crayon or candle (something wax). It’s not unpleasing, but it’s also not a color I would keep coming back to. It’s fairy flat and doesn’t really pop out, but is differentiatable. Bleed-through and feathering are pretty bad, and shading is noticeable, though not too much. Magenta – And now for the final color I’m a bit dubious about. I think it’s magenta. It’s a very deep pinkish color (should I say again like a rose? Roses occur in so many colors) which I can’t find many natural parallels to, nor any really solid work applications. It does look pretty (I guess) but that’s about it. Bleed-though and feathering are terrible with this one, but no shading is evident. And that’s the reds. They look like flowers, and don’t work well at the stereotypical workplace. They work for organizing, but have some pretty extreme properties. They’re certainly the most eye-catching of the bunch (other than yellow).